Like pump curve, this is another very important curve for the system designers. 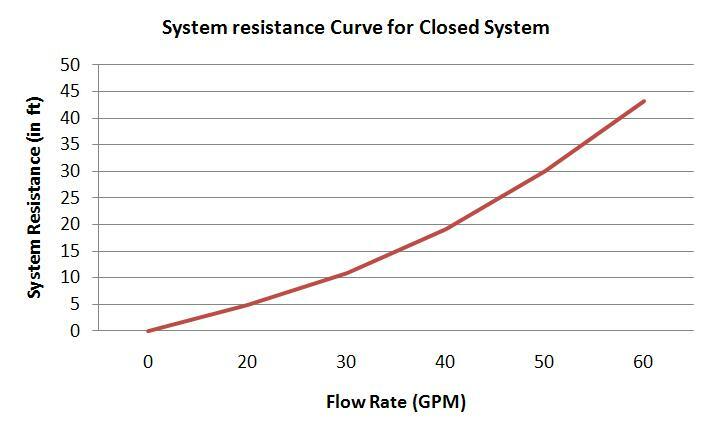 What is a System Resistance Curve? This is a graph plotted with flow rate along X axis and the total resistance to the flow along Y axis for fluid handling piping system as well as HVAC fan system. For the fluid handling piping system it is often termed as pump system head curve. For the HVAC fan system it is often termed as fan system curve. Each system has unique resistance or performance curve which is independent of the pump or fan. Example Problem: Plot the system resistance curve for the water system which produces 30 ft. (water column) of frictional resistance head for a flow rate of 50 GPM. Only factor contributing to the system resistance here is the frictional resistance head. Another rule of thumb: The frictional resistance is proportional to the square of the flow rate. So, total system resistance 1 = 30*1.2*1.2=43.2 ft. So, total system resistance 2 = 30*0.8*0.8=19.20 ft. So, total system resistance 1 = 30*0.6*0.6=10.8 ft. So, total system resistance 1 = 30*0.4*0.4=4.8 ft. I the next article I will discuss how to see how to do the system curve calculation for an open system.